With so many personal tributes pouring in, all acknowledging the influence and importance of the legendary Dr Ian Player, it confirms the valuable life this unique man lived. While much has been written about his role in saving the White Rhino from extinction, and his passion for wilderness, little mention has been made of the grave mining threat facing his beloved iMfolozi Wilderness Area. In 1958, Ian Player fought long and hard to establish iMfolozi as the first wilderness area in Africa, together with the eastern shores of Lake St. Lucia, also threatened 20 years ago by dune mining. Since 1 May 2014, with Ian’s unfailing encouragement and support, I have been spearheading the Save Our iMfolozi Wilderness campaign to stop the Fuleni open cast coal mine, sited a mere 40 meters from the boundary fence. The mine would effectively destroy this sacred area that has transformed the lives of many people. This includes my life and the lives of many other people who are writing moving accounts of profound life-changing experiences and insights gained while walking in the iMfolozi wilderness and dreaming under starlit African skies. Sandile Masondo is a young man who went on a wilderness trail a few years ago. He is from KwaMevane, a township in Howick, about 25kms from the Players’ farm. He arrived at Phuzamoya1 early yesterday morning. Sandile leads a deceptively simple ordinary life, while actually being extraordinary. After the wilderness trail, Sandile climbed Kilimanjaro with the Rhino S.A. team to draw attention to the plight of rhinos and encourage South African youth to become involved in trying to stop the slaughter of these magnificent animals, traditionally royal to the Zulu people. He has made several visits to the Fuleni community, in solidarity with their stand to stop the Fuleni mine that would destroy their lives, their lands, their health, the iMfolozi wilderness and open the way for rhino poachers. 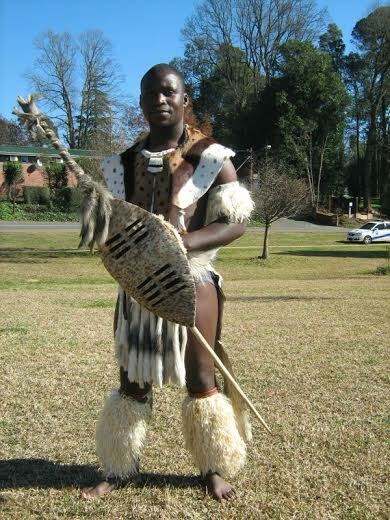 Last year, Sandile walked 3500kms to promote the Zulu language and culture, strongly believing that African people who have lost contact with their traditional roots have no moral or spiritual compass to guide their lives. Yet, he is extremely open to learning about other cultures and languages, including the language of our night time dreams. He attended several Phuzamoya Dream events, monthly gatherings at the farm that resulted from Ian Player’s fascination with dreams ever since his discovery of their hidden value in 1978, when he read Laurens van der Post’s Jung and the Story of our Time, about Carl Jung, the famous Swiss psychiatrist. Sandile then explained the purpose of his visit. According to Zulu tradition, one’s burial place is one’s final house. Sandile had come to ask if he could be given the honour of digging Ian’s grave. He wanted to prepare a comfortable last room for Ian’s body to lie in. This is something Sandile has done for more than thirty close friends and family who have touched his life, including his mother, and Johnny Chonco, a talented musician who accompanied Miriam Makeba on a world tour, but sadly ended up in KwaMevana, enslaved to alcohol. Sandile’s wish has been granted. He is grateful to be able to assuage his pain and shed his tears through the sweat of his body as he digs the grave for this giant of a man, who he deeply reveres, respects and loves. And so, very early in the morning, before any rays of sunlight touch the eastern horizon, Sandile and his honoured team of helpers will meet at the little church where Ian’s family and closest friends will gather later to bury Ian’s mortal remains. Besides saving the rhino, Dr Player’s legacy implies saving human dignity and moral values too. Sandile has embraced this, and his humble tribute should serve as a reminder as to why we are on this earth – to make this world a BETTER place. A giant of a man – we will sorely miss someone of his stature – he has left behind a great legacy may this country do it justice.